See Also: William Umstead (from the Dictionary of North Carolina Biography), Governor William Umstead (from the Research Branch, NC Office of Archives and History); First Ladies and Gentlemen of North Carolina NCpedia collection. Merle Holland Davis Umstead was well prepared for the job of first lady. Her husband, William Bradley Umstead, had served three terms in Congress during the Franklin D. Roosevelt administration, as chairman of the State Democratic Executive Committee, and as a United States senator; as a result, Merle Umstead brought years of experience in political life to the Executive Mansion . Merle Davis was born July 11, 1901, in Bostic in Rutherford County. Her parents, Charles Daniel and Daisy Washburn Davis, ran a store in the Sunshine community. After graduating in 1919 from the Normal and Collegiate Institute, an Asheville boarding school, she became a high school teacher and the principal at the Sunshine School in her native Rutherford County. From 1921 to 1922 she attended Trinity College (known as Duke University after 1924). After a year, she left school for employment in Raleigh with the Internal Revenue Service. She returned to Trinity College in 1923, however, and graduated with a degree in English in 1926. While at Duke she took a job caring for the children of a prominent Durham family and became acquainted with one of her employers' relatives, a young Durham attorney named William B. Umstead. In 1926 she returned to Sunshine School as principal and then taught at Rutherfordton's Central High School. 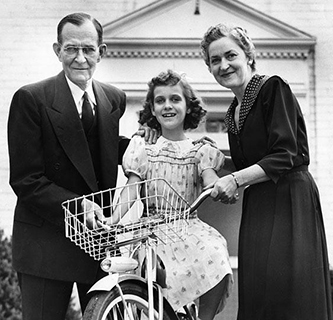 She continued to teach until she married William B. Umstead on September 5, 1929, at Durham's Trinity Methodist Church. Following the mar­riage, Merle Umstead engaged in numerous activities in Durham, including serving as presi­dent of the Durham American Legion Auxiliary and teaching Sunday School at Trinity. Just three years after their marriage, her husband ran for his first term in Congress. While the Umsteads were in Washington, they resided at the Willard Hotel, a customary residence at the time for members of Congress and their spouses. A regular at congressional dinners and functions for congressional wives, Merle Umstead was active in Washington's social life. One of her favorite activities was giving guided tours of the city to friends and con­ stituents from North Carolina. William B. Umstead left the House after three terms in 1938 and then practiced law in Durham. In 1946 he was appointed to the U.S. Senate upon the death of Senator Josiah W. Bailey. During Umstead's term in the Senate, Merle Umstead maintained their residence in Durham, raising their young daughter, also named Merle, who was born in 1942. She and her daughter traveled to Washington frequently by train, however. Senator Umstead was elected governor in1952 and inaugurated on January 7, 1953. Just two days into his term, he suffered a heart attack. As a result, the first lady played an even more important role than usual in his administration, including being largely responsible for managing the governor's schedule. Governor Umstead held most of his appointments in the mansion, often around a table in his bedroom. Since his schedule was limited by his heart con­dition, Merle Umstead determined which invitations to accept and which to decline, and which events were important enough to work into the governor's limited schedule. Despite the unusual circumstances, Merle Davis Umstead managed the mansion beautifully, without problems or complaints, even though she did not have an office staff, social secretary, or appointments manager. Laura M. Reilley, housekeeper, and Merle's mother, Daisy Washburn Davis, were there to assist, however. Merle D. Umstead treasured life in the mansion. She loved flower arranging and took delight in the fresh flowers that were frequently sent from the prison farm. She enjoyed giving tours of the man­sion to school groups -seating the children on the grand staircase and telling them of the building 's his­tory and treasures. An early appre­ciation of antiques and heirlooms inspired her to collect Davis and Umstead family furniture and treasures - not so much for their monetary value as for their history. She was also interested in cooking. She always used the fresh­est ingredients available and took great pride in the preparation of dishes. She took cooking lessons and saved many menus and recipes from important events. The Umsteads had planned to build a house in Durham when the governor left office. The governor's death on November 7, 1954, before the completion of his term, changed all of that. The first lady and their eleven-year-old daughter had to vacate the mansion almost immedi­ately and were without a home. Merle Umstead never built the house she and her husband had planned but returned to Durham and eventually purchased a home designed by Durham architect George Watts Carr. In the years following her husband's death, Merle Davis Umstead remained active in the public life of North Carolina. She was a longtime supporter of the Roanoke Island Historical Association and served as the Durham County leader of that organization for many years. From 1955 to 1961 she was a member of the East Carolina University Board of Trustees. Merle, who saved many of her husband's documents and maintained scrapbooks of their political careers, took an active role in the publication of the Public Addresses, Letters, and Papers of William Bradley Umstead, Governor of North Carolina, z95.3-z954. She provided a home for many students attending Duke University and Durham Technical College. In addition, she actively managed family timberland in Rutherford County. Merle Umstead lived in her home in Durham until her death on April 14, 1988. She was buried beside her husband at Mt. Tabor United Methodist Church in northern Durham County, where Governor Umstead had grown up. Merle Davis Umstead was survived by her only child, daughter Merle B. Umstead Richey, a Durham attorney and the wife of Russell E. Richey, and two grandchildren, William, born in 1970, and Elizabeth, born in 1977. Ham, Marie Sharpe, Debra A. Blake, and C. Edward Morris. North Carolina's First Ladies, 1891-2001. Raleigh: Executive Mansion Fine Arts Committee and Executive Mansion Fund, 2001. Morton, Hugh. "Photograph, Accession #: H.1971.68.1." 1960-1962. North Carolina Museum of History. https://collections.ncdcr.gov/RediscoveryProficioPublicSearch/ShowItem.aspx?34878+ (accessed February 21, 2019). 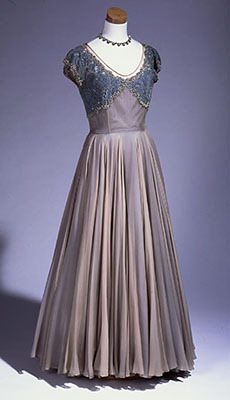 Merle Umstead inaugural gown, blue chiffon, 1953. Item H.1957.8.1 from the collection of the North Carolina Museum of History. https://collections.ncdcr.gov/RediscoveryProficioPublicSearch/ShowItem.aspx?61523+ (accessed August 2, 2017).